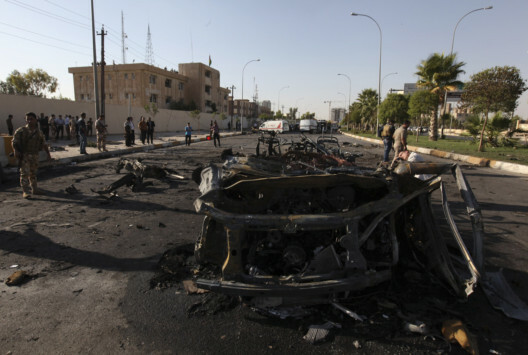 Baghdad: At least 40 people were killed when a suicide bomber blew himself up at a Shiite funeral in a southern Iraqi town on Sunday, hours after six people were killed in rare Arbil attack. Militants killed six people in the capital of Iraq’s autonomous Kurdish region in an area usually spared the violence plaguing other parts of the country. Prime Minister Nouri Al Maliki’s spokesman said the deadly attack may be linked to the bloody civil war in neighbouring Syria, where jihadists have battled Kurdish forces. A statement from the Kurdish asayesh security service said a suicide bomber detonated explosives at the entrance to their headquarters in Arbil, the capital of the northern region. Asayesh forces then clashed with four more bombers, killing them, before another detonated an explosives-rigged ambulance. Kurdistan region health minister Raykot Hama Rashid told journalists that six asayesh members were killed and more than 60 people wounded in the attack. An AFP journalist heard blasts in Arbil, and heavy gunfire. Smoke was seen rising into the air, and ambulances raced to the scene. Sunday’s blasts were the first to hit Arbil since May 2007, when a truck bomb exploded near the same asayesh headquarters, killing 14 people and wounding more than 80. “Syria has affected all of us,” Al Maliki’s spokesman Ali Mussawi told AFP, adding that the Arbil attack may be “one of the offshoots of the Syrian crisis”. Hours later, a blast at the mosque brought down the ceiling in Mussayab, 60km south of the capital Baghdad. Police said some bodies were still trapped beneath the debris. At least 50 people were wounded. Those inside had been mourning the death of a man killed a day earlier by militants. “Until now, we are trying to retrieve bodies from under the debris. Most of the bodies were torn to pieces. Legs and hands were scattered on ground,” said a policeman at the scene. It was not immediately clear who was behind the bombing, which is the latest in a spate of attacks targeting both Sunni and Shiite places of worship, particularly during funerals. Iraq’s delicate sectarian balance has come under growing strain from the civil war in neighbouring Syria, where mainly Sunni rebels are fighting to overthrow a leader backed by Shiite Iran. Both Sunnis and Shiites have crossed into Syria from Iraq to fight on opposite sides of the conflict. Al Qaida’s Iraqi and Syrian branches merged earlier this year to form the Islamic State of Iraq and the Levant, which has claimed responsibility for attacks on both sides of the border. Suicide bombings are the hallmark of Al Qaida. Several other attacks in recent weeks also suggest that Shiite militias, which have so far largely refrained from retaliating, may once again be resorting to violence.